Achieving gorgeous hair is as easy as 1, 2, 3 with the Grow Gorgeous Three Steps to Gorgeous Kit. This routine covers all bases to ensure hair feels fresh, thick, healthy and nourished right down to the root. Containing a travel-sized Scalp Detox, our pre-wash exfoliating treatment to purify your hair and scalp, a travel-sized 11-in-1 Cleansing Conditioner to deeply cleanse and condition and a full-sized Hair Growth Serum, a must-have for any woman wishing for longer, fuller and thicker hair. Chic travel pouch included. RRP $40 (Worth $68). Detox your scalp from impurities that block the roots with pomegranate enzymes and natural castor oil beads. Exfoliate your scalp and shift dry skin to create the perfect environment for hair growth. This works to deeply cleanse and condition your hair while nourishing each strand for soft, healthy hair. The Cleansing Conditioner benefits your hair in 11 different ways, including: improving shine, adding volume reducing frizz and flyaways and making hair easier to style. Our iconic Hair Density Serum is your secret weapon for achieving long, luscious locks. For fine hair lacking that extra oomph or even if you simply want to kick-start your way to Rapunzel-esque locks, continued use of this super serum packed with powerful ingredients will have wondrous effects on the thickness and length of your hair. Directions for use: Step 1: Massage Scalp Detox into your scalp, rinse. Step 2: Use the 11-in-1 Cleansing Conditioner to cleanse and nourish hair. Step 3: Apply Hair Density Serum daily to dry roots and massage in well. Pre-Wash Treatment: Use 1-2 times a week as a pre-wash treatment, before cleansing hair. Wet hair and scoop a generous amount from the jar, rubbing it between your hands. Use your finger tips to massage the product all over the scalp in circular motions. When the entire scalp has been thoroughly exfoliated, leave for a few minutes to allow the cooling sensation and purifying properties detoxify the scalp. 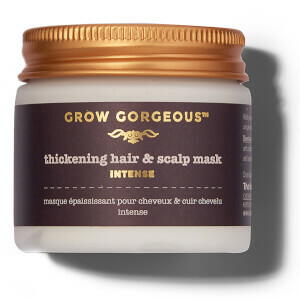 Thoroughly rinse and cleanse your hair using Grow Gorgeous Cleansing Conditioner or shampoo. Cleansing Conditioner: Add a generous amount to wet hair, massaging into scalp before smoothing through to ends. As our Cleansing Conditioners are sulfate-free you won’t experience much of lather from the product, we promise it’s still working. After three minutes, rinse thoroughly, while continuing to massage hair and scalp. Dry and style as normal to reveal gorgeous hair. Serum: Apply 20 drops to the scalp and massage well. We recommend dividing your hair into four sections and applying 5 drops from the pipette directly to the scalp along the hair line in the first section, massaging well into the scalp. Repeat this on the remaining three sections, applying 20 drops in total. Finally, ensure the product is massaged well within the scalp. Use morning or night. Do not rinse. These are the best beginners products to use to grow the most gorgeous hair ever. When you use all these products, even for the first time, you will experience the difference in your hair. Your hair will feel stronger and look amazingly healthier. Nothing, I have experienced beats these results.